Zef Eisenberg is the founder of Maximuscle, but he also likes going fast. Really fast. 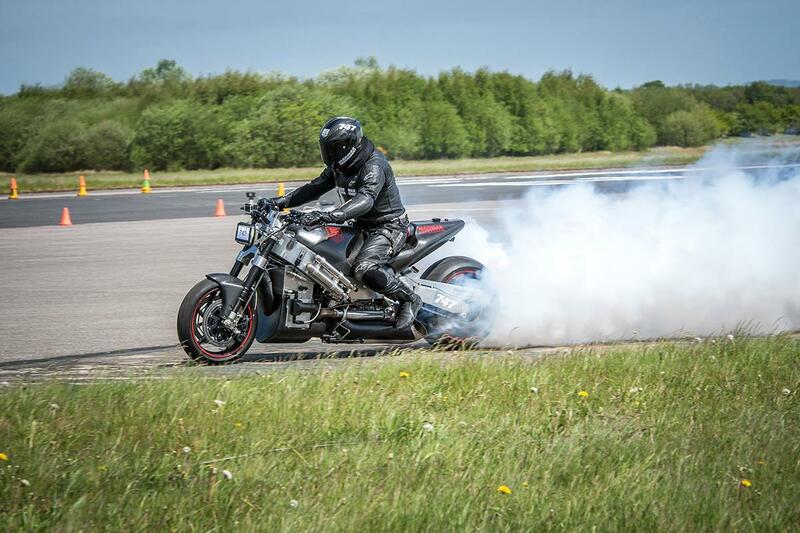 He holds the top speed record for a motorcycle at Pendine Sands at 184mph, and he's looking to break that this year. He also owns a bike with a turbine engine, and is in the process of producing a limited run of V8-engined bikes. 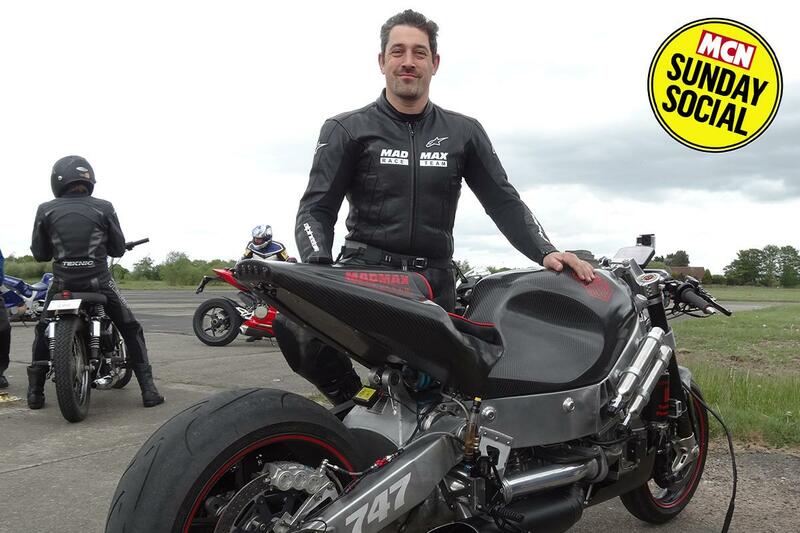 We spoke to Zef ahead of his weekend at Elvington getting his bikes ready for Pendine Sands. How are you doing, Zef? So you have a record attempt coming up next weekend is that right? "Tomorrow. Oh, sorry. We’re at the speed trials tomorrow where I’ll be back for the first time on my jet turbine bike and we’re also taking our land speed bike called the Green Monster, which is our 300bhp supercharged Hayabusa which we’re going to tweak and tune to make sure everything is set up ready for next weekend at Pendine Sands. I already hold the production bike record at Pendine Sands, which I got last year at 184mph with our ZX-14. We’ll be looking to exceed that and go for the speed that nobody’s ever done – car or bike – and that’s the magic 200mph." Nobody’s ever done that on sand? "Nobody’s ever done that on a car or bike before at Pendine Sands, so that will be a really super exciting goal to try and achieve. What makes the sand speed trials so challenging is that nothing you learn on tarmac or drag racing, anywhere, works on sand. As you can appreciate from a biker’s perspective, you can have 500bhp drag bikes at Santa Pod, they’re not going to work on the sand because if the tyre just spins then you’re not going anywhere. Nobody cares if you’ve got a sticky tyre or a flat tyre because it doesn’t give any grip." Have you got something like a paddle tyre then? "No, they don’t work, they just dig a big hole for you. Those paddle tyres are designed for sand dunes. If you start putting on nitrous and turbo power that’s also useless because it’s just like an RD350 when the powerband kicks in and the tyre just spins. There are real challenges going fast on sand that just surprise everyone. It’s the most challenging, frustrating and exciting form of racing I’ve ever done." And what about slowing down, obviously that’s going to be completely different as well? "The simple rule is you don’t ever touch the front brake. A lot of people just remove the front brake lever to avoid that automatic impulse to touch the front brake. If you’re on track or a runway the first thing you do is grab a handful of front brake to slow down. Not on sand you don’t unless you want to wipe out big time. Another problem as well is that if you crash on sand, it’s not a good thing because you don’t slide. On tarmac or a racetrack the whole idea of wearing leathers is that you slide, and that takes away a lot of the problems. On sand it’s a little bit like coming off on water, beyond 40mph it bloody hurts and you don’t go anywhere. It’s definitely I think the most extreme form of racing but it also gives me the most buzz." When did you start getting involved with the straight line and sand racing? "The sand racing was 2015. They haven’t allowed racing at Pendine at all recently. It used to be really popular with people like Donald Campbell in the 1920s and ‘30s. It had a huge history and then it got closed during the war and was used as an MOD test firing centre. That was it, it was out of bounds for all the public and it only opened up a few years ago. We’re all really dipping our toe in the water in terms of what you can do down there. "One of the most amazing things about it is that it’s a natural track, so you wake up in the morning, the tide goes out, and you don’t know what you’re going to find. You might find unexploded ordnance, which happened last year for us! Literally an unexploded bomb on the sand that had to be removed. When I was there in 2015 they had the most monster jellyfish all the way down the track. I’m talking half a metre wide and 40cm high of rotting detritus. If you hit that with your tyre it explodes like a water bomb, covering you in rotting liquid. So it’s the most extreme, crazy form of riding I’ve ever done. You could end up with completely rippled sand that’s not a nice place to run. Or you could have it completely billiard smooth - it all depends on the waves and the storms the night before." How did you get involved with the straight line stuff originally? "I’ve been riding since 16-years-old. As soon as I could get a licence I got a 50cc Yamaha and worked my way up, you know, in the old school way until I got my first slabside GSX-R. Got involved doing wheelies, as one does, then turned it into a streetfighter and got involved in the stunt scene and it just went from there really. 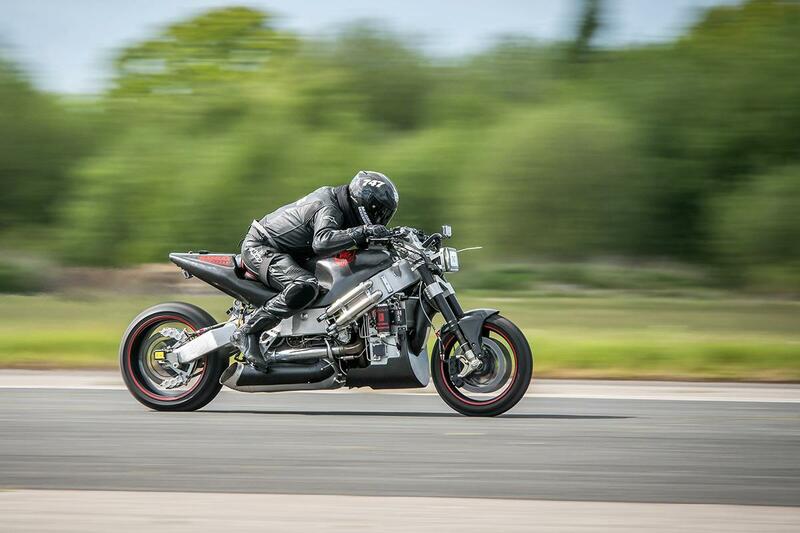 Then I decided that I’d go to one of the speed trials in 2011 I think with one of our turbine bike projects and it bit me hard and I absolutely loved it. It either gets you or it doesn’t. "What you find, is the amount of passion in people trying to find that tenth of a second at Santa Pod, or that extra 1mph. You might do 199mph, but you haven’t got 200, and you walk away massively frustrated. You might get 299mph, but you haven’t got 300. 10.01 seconds at Santa Pod, but you haven’t got 9.9 seconds. That’s what I love about it, the camaraderie, the non-money glorification of it is what’s great. We all do this for the true passion and excitement of the racing. We don’t do it for money or accolades. It’s just to try and push the boundaries." How does a turbine bike compare to a standard bike? "It’s beautiful. We’ve developed our turbine bike over the last five years and it will deliver 560bhp at the rear wheel, not at the crank. The torque curve is completely flat and linear, there is no powerband, anything. The trick is not to be afraid to open the throttle. No gears or anything, it puts over 1000ftlb of torque down through the rear wheel." You must go through rear tyres quite quickly, then! "Yeah, it will go through a rear tyre in a day. If you open that throttle too quickly you’ll just spin the rear wheel up and it’ll do a 200mph burnout in four seconds. It will literally melt the tyre, so you’ve got to feed in the power really carefully. Often, when we’re racing, we spin the tyre out at 200mph." "It delivers so much torque it’s hysterical, so you’ve got to feed it in really gradually, there’s no gearbox at all. We have an F1 carbon clutch to feed in the power." It’s a jet turbine engine, is that right? "Yes, it’s a Rolls Royce C20W engine which comes from the Agusta 109 helicopter. The big helicopter that takes six people in comfort, we’ve put one of those in a bike." It sounds mad. Is it still a conventional throttle on a turbine bike? "Absolutely. Obviously we’ve done quite a lot of modifications to the engine, so we actually manually throttle it. There are two types of turbines. There’s a thrust turbine, which you might find in something like an F-16 fighter jet, which just gives you tonnes of big blue flame, tonnes of thrust, and forces you through the sky with thrust. There’s no direct drive. We’re using a shaft turbine from a helicopter, so you’ve got a turbine which effectively goes through a gearbox and turns the blades. So, in the crudest possible way, imagine chopping the blades off, and putting a sprocket on it and then mount that in a bike on its side. We’ve got a sprocket mounted on the turbine going to the rear wheel sprocket like a conventional motorbike. Then we’ve modified to use a conventional throttle from a bike. There’s a little bit more to it than that but that’s it in the crudest form. "One of the biggest challenge is the massive lag. You’ve probably even seen it from planes and helicopters – they don’t exactly rev like Formula One engines. They’re like a massive turbo with massive lag, and it takes a couple of seconds for it to do anything. So I can be at the start line, open up the turbine and I’m waiting for the power to come in. People always say at the start line ‘why don’t you go?’ and it’s just that the power hasn’t come on yet. The funniest thing is I’ve got to stop the turbine, half a second before the finish line otherwise it keeps making power for another 500 feet. "That was the problem with my crash last year. The turbine’s making so much power that you shut the throttle off and it’s still making power. You can grab the brakes and it doesn’t care you’ve put the brakes on. You’ve got zero engine braking. The bike idles with 80bhp, so it’s a bit like having reverse engine braking. When I start the turbine and it’s slightly damp I can hold the front brake on and it will still drag the bike forward along the ground. It’s quite freaky, and a bit off putting, which is why most people say no when I offer them a go!" I think I’d say the same! Why did you go for a turbine bike in the first place? "Firstly it’s different, and I get turned on by the engineering challenge. I get turned on by trying to push the boundaries of common sense. We do race other things – we do a lot of quad bike racing and hill climbs with conventional engines, but when it comes to land speed racing once you perfect the turbine engine it’s just incredible. It delivers power and torque and noise like nothing else. "You’ve got to remember these Rolls Royce turbine engines are designed to fly 1000s of hours in the sky. So it’s the funniest thing at the end of a race meeting when everybody else is rebuilding engines and checking pistons I literally stick a hose pipe in the front of the compressor, do a little spin for 10 seconds and go home. That’s it, the servicing is done and it’s ready for the next race. And it runs normal diesel! It’s fully road legal that takes normal road fuel." Wow, I expected it to need aviation fuel. "Yeah. It will take kerosene, Jet A, or pump diesel. So when I did the record last time I actually rode it upto Elvington with a rucksack." Does the type of fuel you use make any difference to how well it runs? "Obviously it prefers kerosene or Jet A because they’re cleaner. There are a lot of additives in pump diesel, which the turbine doesn’t care about. It quite likes diesel because it’s quite high energy, but it just creates more smoke. I prefer to run the kerosene because you have to put less water in afterwards to clean it. People are always amazed because the drag bikes are always running that fancy race fuel, which is super expensive and we just syphon it out of the van! It has its pros and cons in many ways but that’s definitely one of the pros!" Do you ride it on the road often? "Yeah. There’s a wonderful video of me riding it up the M6 last year, stopping at the service stations." So how far will it go on one tank? "Ah, well, this is one of the negatives. It doesn’t do miles per gallon, it does time. Effectively once you turn the turbine on it burns a litre a minute. If you’re sitting in traffic, it’s still burning a litre a minute, but if you’re doing 200mph it’s got great miles per gallon! It’s exactly like a plane. A plane likes to be up high, 30,000ft in the sky, cruising in the jet stream, what it hates is short hopes, you know, taking off, taxiing. When a plane is sat on the runway at Heathrow it’s burning tonnes of fuel and it’s exactly the same thing with the turbine bike. So my range is actually a stopwatch, which counts down from 32 minutes. The tank takes 32 litres of fuel. I literally just press that and pause it every time I turn the turbine off and that tells me how much fuel I’ve got left." Maybe not the most practical then! "I wouldn’t suggest it as a commuter bike, no." Have you got anything else coming up with the turbine bike? "We’ve got some super crazy stuff. Once I get these two challenges out of the way we’re going to reveal a project so crazy they’re not going to believe us." Is 200mph on sand not crazy enough? "Well, the team’s name pretty much gives a clue to what we do, which is building totally mad, extreme vehicles for the hell of it." "Exactly. As we all know we’re going down the route of electric vehicles in the future so we might as well put our legacy on the world of mad piston and turbine engines as long as we’re allowed to." Have you got one eye on electric bikes in the future? "There is no doubt about it. We are super excited about the electric side of things, especially now the technology is improving so rapidly. The way things are going now, for example with the Isle of Man TT electric bikes that are starting to chase the lap times of the piston bikes, we’re seeing some phenomenal improvements in lithium battery technology and with very high-powered motors. "You don’t need gearboxes, they have huge amounts of torque – they’re like turbines in a way with a very linear power curve. I think when people experience that they’re going to think it’s amazing. The only problem is the sound. I think one’s got to create a sound that people like, because I believe one of the exciting things about riding a motorbike is that it stimulates all your sense, you know? The noise, the vibration – everything about it. Electric bikes may accelerate incredibly but they’re silent." I’ve ridden a couple that have that electric whine, and it’s quite cool, but it’s definitely no replacement for a big v-twin or an inline-four. "I’ve been at Ballaugh Bridge a few times and I’ve watched the Zero TT there. John McGuinness came past on the Mugen. All you could hear was the chain flopping and the transmission noises. It’s not the same thing as the other bikes! But we’re definitely excited by that and we all know it’s the direction that things are heading, especially now they’ve announced we’re not even going to be allowed to ride what we can now by 2040." I thought that was just sales of new cars and vans? "Well they’re saying that you won’t be allowed to drive any motorbike or petrol, piston or diesel car in London. They’ve thrown the gauntlet down to all the manufacturers." Well they’ve got 23 years. "It soon creeps up though. The year 2000 doesn’t seem long ago." I noticed on your social media you’ve got a V8 bike as well, that you want to put into production? "Absolutely, it’s fantastic! It’s got a 480bhp naturally-aspirated V8 in it. Every single thing on the bike is bespoke built by us. We tested it in May last year. We did 209mph in a mile just running the engine in. We’re going straight back into that after these two record challenges and getting straight back into the production side of things. As a race bike it’s totally proven, but it needs a team around it to tweak and tune and make sure it all works. Our goal now is to take it to production level, which means it’s got to do 45 minutes in London traffic, it’s got to cope with the heat and the cooling and the plumbing, and everything has to work. "We can’t give people a 480bhp bike because they’ll sh*t themselves, so we’ve got to do what they do with Ferraris – and like motorbikes now – and the power modes. Give them an urban, a town and a race mode. We’ve got to do all that and make it not scary to the general consumer. The next thing is to get one of you guys to ride it at Bruntingthorpe. At the moment it’s running eight independent throttle bodies, it’s a flat crank V8, which means it sounds like an F1 race engine, it’s not like a lazy Chevy, it’s full on revving to 11,000rpm. You just touch the throttle and it screams! It’s got a five speed gearbox, not that you really need first or second gear in the slightest, you just use the clutch in town riding to control the power." Has riding all these crazy bikes diluted normal bikes and road riding for you? "No, not at all! I love all kinds of bikes. What might surprise people is the first thing I did when I came out of hospital in the wheelchair - well obviously I learnt to walk again with crutches – is I went and bought a Suzuki VanVan 200. It’s got a really low, comfortable seat and I built myself a crutch holder. I’d walk to it on the crutches, put them in the frame and ride everywhere. Before I could even walk properly I was biking riding a bike again. I’ve got a massive affection for small bikes. I hadn’t ridden a 200cc bike since I was 17-years-old, and I’d forgot how fun small cc bikes are because you just scream it everywhere and it’s a laugh a minute! "Obviously I customised it as I can’t resist mucking about with bikes. I let my mates, who ride GSX-Rs and things, have a go and they all loved it. Two of them went out and bought their own! We live in this world know where all new bikes have 200bhp, and we forget the old days of screaming round on these small bikes that are actually great fun. I’m a bike junkie. I’ve got the Multistrada for touring and riding with the girlfriend, and I’ve got small bikes for cruising round Guernsey where there’s a 25mph speed limit. The problem with motorbikes is there’s no perfect motorbike, so it will take a lot to get me off bikes, for sure." Was there ever a point after your accident last year when you thought you wouldn’t get back on a bike? "I never thought I wouldn’t get back on a bike, but I definitely thought I wouldn’t race again. The doctors were telling me I’d never walk again, my friends and family wanted me to take up knitting or something safe. I went to some very dark places, got quite depressed. I was in a six foot by three foot prison bed in hospital for three months. All I could move was my left arm, everything else was broken. I broke both pelvises, pubic bones, hip, femur, ankle, three bones in both hands, ripped the rotator cuff off the shoulder, everything. I couldn’t see for about three weeks because I had minus 25G deceleration. It was pretty torturous, so, yeah, you do think ‘screw racing’. "But then I got better and I couldn’t help it. It’s a bit like Rossi. He’s an old boy like me and he’s broken his leg. Is he going to stop? Of course not. Racing is in his DNA, bumps are part and parcel. Look at Guy Martin, he’s probably the best advocate for bashing yourself and getting back on. I think that’s why he’s so popular, because he doesn’t give up, he dusts himself off and goes out again. I found Guy very inspirational when I was recovering. I’m also one of those people who, when people say ‘no, you’re never going to do that again’, I say ‘screw you’, and I go out and do it."